It’s July! 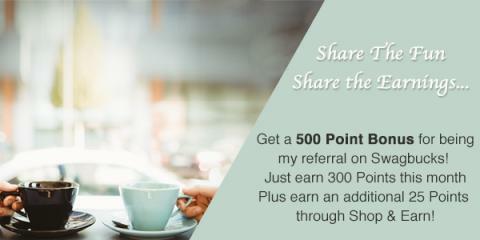 Get up to 300 bonus SB with the new Swagbucks July Swago! Pull out your paddling pool, uncoil the hose, fill up the pool, add some rubber ducks, pretend you’re at the beach, and let’s get earning! You could earn up to 300 SB in the new Swagbucks “Swago” promotion, the Beach Bash edition, starting Monday, 9th July, at 5 PM BST (9AM PT). Swago is just like bingo, but in this case you’re filling out squares as you earn points on their site for doing things you already do online. For each completed square you’ll also earn spins on the Spin & Win wheel! If you’re thinking of trying Swagbucks, this is a great chance to learn all about how the site works and earn bonus points while doing it, meaning you can get more gift cards faster. Top Tip: The Swago board usually contains a “Refer a friend” square. Wait until Sunday 1st July to refer your friends so that they have the entire month of July to earn enough to get the referral bonus rather than stressing about trying to do it in the last few days of June. You have until 8pm GMT (12pm PT) on Monday, 16th July to mark off as many squares as possible so use your time sensibly. The Spin & Win Wheel will be available all throughout Swago. Click here and then click “Join” to get started! If you don’t already have a Swagbucks account, you’ll be able to quickly sign up; PLUS, if you earn 300 SB before the first of next month, you’ll get a bonus 300 SB! The Swago board ends on Monday, 16th July at 8 PM BST (12PM PT). Make sure you’ve submitted a pattern before then! « Big changes herald good news for Grabpoints users!